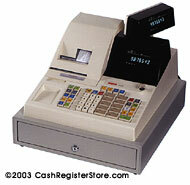 Sanyo ECR-345 Electronic Cash Registers at Cash Register Store. The Sanyo ECR-345 provides today's retailers with one of the most-cost-effective Electronic Cash Registers in its class. With an extended feature package and stylish cabinet design, it offers excellent performance value. The ECR-340 is a durable, reliable solution to your electronic cash register needs. The ECR-345 is a new system just released from Sanyo's factory. The ECR-345 differs from the ECR-340 in the type of printer only. The ECR-345 uses a very heavy duty Epson 812A numeric drum printer, with validation and logo stamp. The printer has a receipt and journal printer, which is useful for keeping every sales transaction recorded. This cash register comes standard with a full size metal cash drawer with removable till.